Major participants in the organ preservation market comprise BioTime, Inc., BioLife Solutions, Inc., CryoLife, Inc., Claris Lifesciences Limited, Lifeline Scientific, Bristol-Myers Squibb, Teva Pharmaceutical Industries Ltd., Dr. Franz Köhler Chemie GmbH, ToleroTech, Inc., and Preservation Solutions, Inc. among others. These players are said to tower the development of organ preservation market in the years to come. According to analyst at Zion Market Research, the global organ preservation market added up for USD 163.32 Million in 2016 and is likely to cross USD 262.06 Million by end of 2022, developing at a CAGR of almost 8.2% from 2017 to 2022. The major boosters for organ preservation market comprise increasing solid organ transplantation processes, as per analyst at Zion Market Research. Moreover, rising aged population all over the world paired with increasing multi-organ breakdown incidences is also likely to bolster organ preservation market in years to come. In addition to this, rising government initiatives to support organ donation will also power the development of organ preservation market. On the other hand, limited scope at the level of end users and the high price of purchase are likely to hinder the growth of organ preservation market in coming years. Despite these limitations, R&D in the organ preservation market is likely to be a catalyst for organ preservation market in the near future. For example, in July 2015, UW Hospital invented a new organ preservation method that can replace UW Solution, thereby towering the organ preservation market. Based on organ type, the global organ preservation market is divided into lung, kidneys, heart, liver, and other organs. Preservation of kidney added up for the biggest share in organ preservation in 2016 due to the rising elderly population paired with rising occurrence of kidney failures. According to National kidney foundation, over 80% of all people who get therapy for kidney failure are in prosperous nations with worldwide access to large elderly populations and health care. In terms of regions, in 2016 North America ruled the organ preservation market. The growth of organ preservation market in this area is credited to rising number of organ transplants and favorable reimbursements cases within some areas in Canada. Europe is likely to grab the second spot in organ preservation market in coming years due to technological advancements and a considerable contribution from Spain. 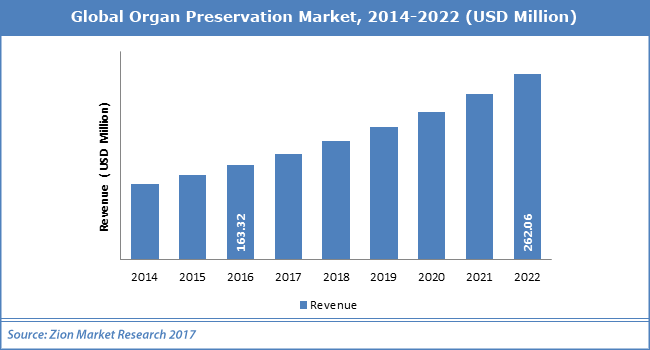 Organ preservation market in Asia Pacific is likely to see the quickest development rate in the near future owing to rising per capita expenditure on healthcare.